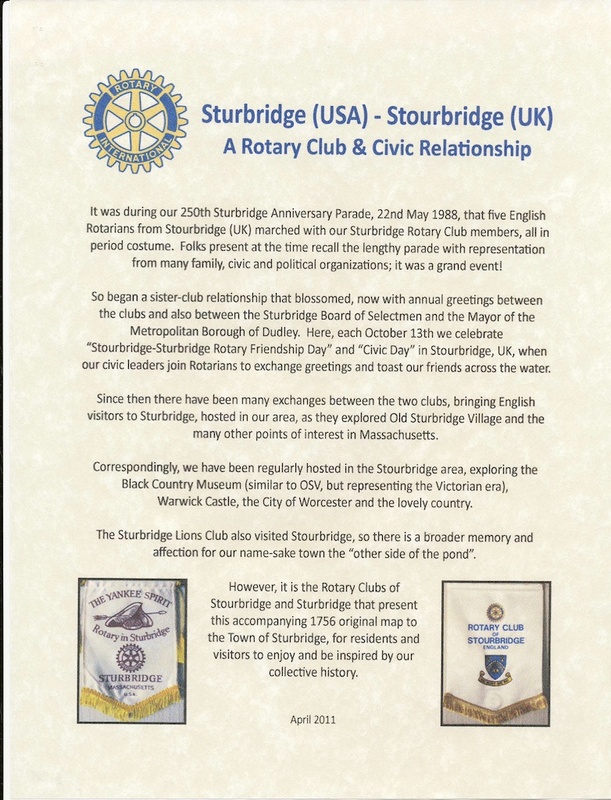 The Sturbridge USA and Stourbridge UK Rotary Clubs have been sister Clubs since 1988, during which time there have been many exchanged visits between the two Clubs. The friendships developed over the years have resulted in multiple symbols displayed in several locations in Sturbridge. 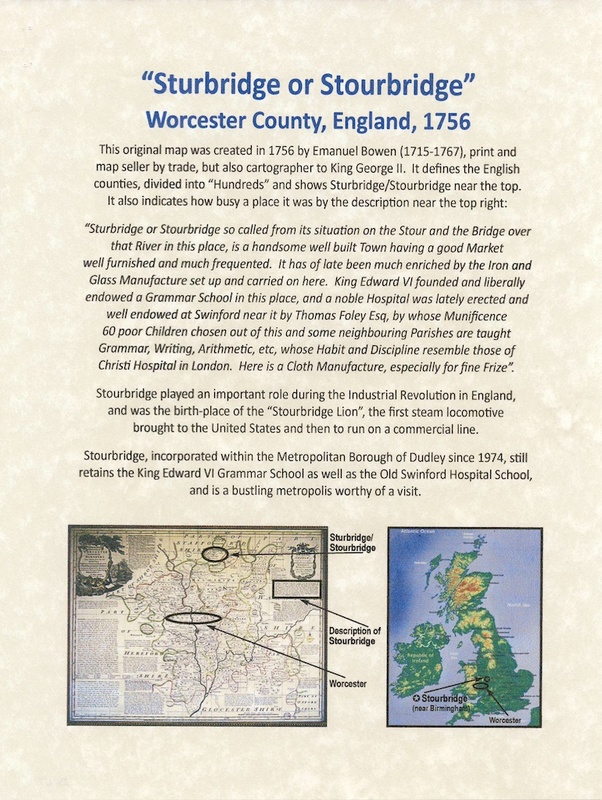 Of those, the original maps printed in 1756 and 1720 give an insight into the location of Stourbridge, relative to Worcester UK and other significant towns, as well as some insight into the agricultural and industrial activity in Stourbridge at the time. 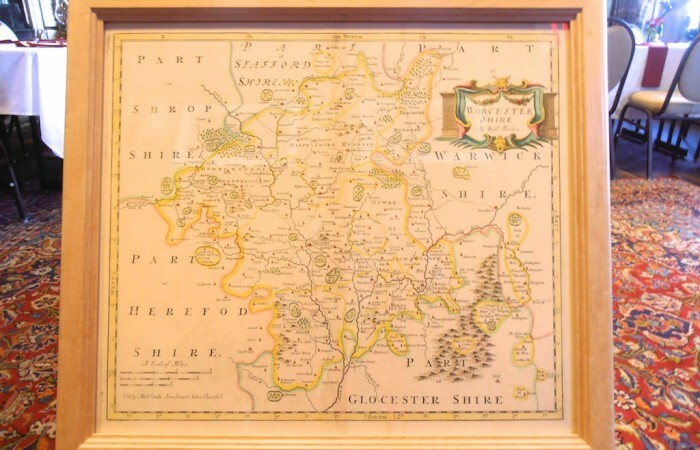 John Farmer, a respected Stourbridge Rotarian, acquired both maps that were generously gifted to the Sturbridge Rotary Club by the Stourbridge Club. 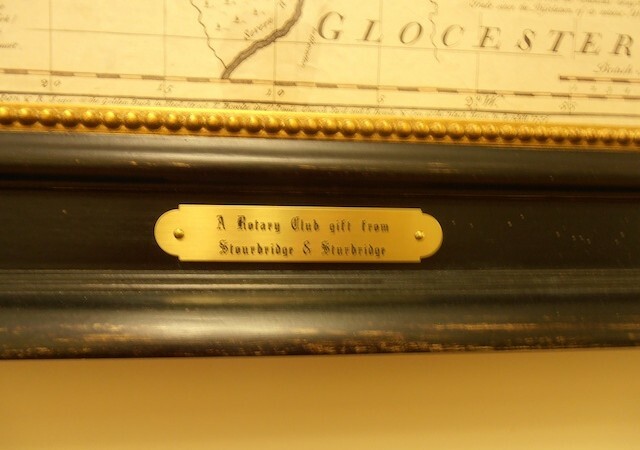 Once in the USA, the maps were reframed with art-glass by the Sturbridge Club to preserve them. The 1756 map, created by Emanuel Bowen – the Royal Cartographer – had two additional panels created to explain the map’s significant features, and presented to the Town of Sturbridge in a ceremony held in the Town Hall on May 16, 2011. This trio now hangs in the main passageway of the Town Hall besides the old safe door, for all to enjoy. 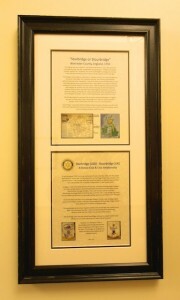 The 1720 map now hangs in the Publick House Historic Inn, located at Sturbridge Common, where the Sturbridge Rotary Club meets. Emanuel Bowen was a print and map seller by trade, he was also engraver to both George II and Louis XV of France. From 1714 onwards he worked in London and began to produce some of the finest and most appealing maps of that era. 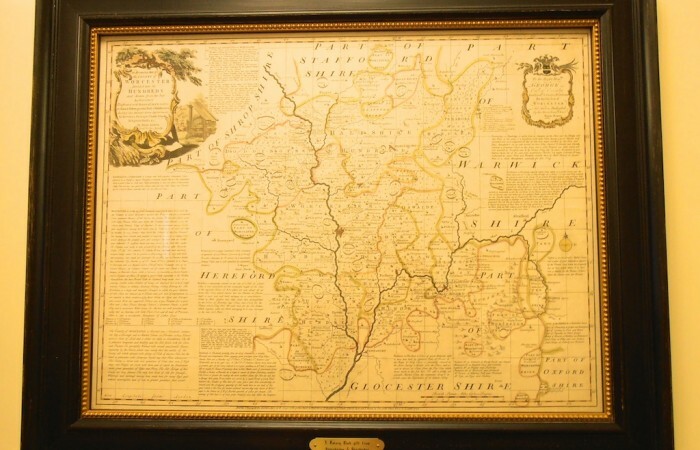 He had great plans to publish a complete County Atlas, however he simply did not have the means to achieve this alone; so he joined forces with another map-maker, Thomas Kitchin, and together they published ‘The Large English Altas’. In 1749, before the completion of the Atlas, they began to issue the individual maps and in 1760 the Atlas was finally finished. With few exceptions, the maps in ‘The Large English Atlas’ were the largest (27″ x 20″) county maps ever to have been produced. They were also quite different to other maps of their time because of the topographical and historical details which were engraved around them in any blank spaces. This made them far more entertaining to peruse. At a later date, the Atlas was reissued, the only alteration being a reduction in size. Along with various maps and Atlases, Bowen produced a book of road maps, very much in keeping with those of Ogilby, although much like the maps in ‘The Large English Atlas’, Bowen embellished them with historical detail and heraldic images which set them apart from others as his own work. His son,Thomas, also produced some beautiful maps, having started helping his father when he was young. He continued by himself long after Emanuel’s death. A framed history of Stourbridge, UK (top) and a history of the Rotary Clubs’ Twinning (bottom). See close-up views below. 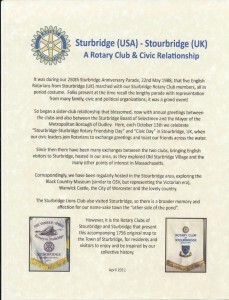 History of the Rotary Clubs’ relationship between Sturbridge (USA) and Stourbridge (UK). 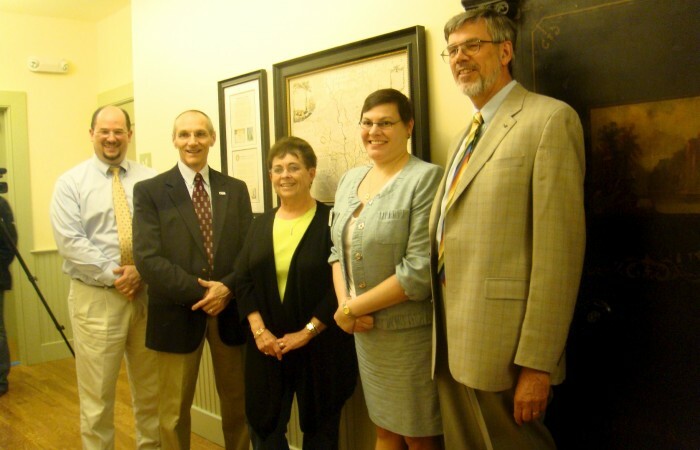 Stourbridge 1756 map in Sturbridge Town Hall with town officials: Shawn Suhoski, Tom Creamer, Mary Blanchard and President Jenn, PDG Klaus Hachfeld. Dedicated May 16, 2011. The plaque indicating the gifts. 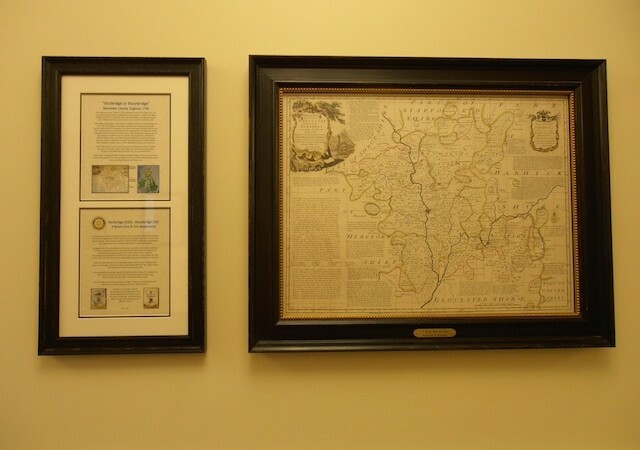 Location of maps and history in the Sturbridge Town Hall - 1st floor hall. 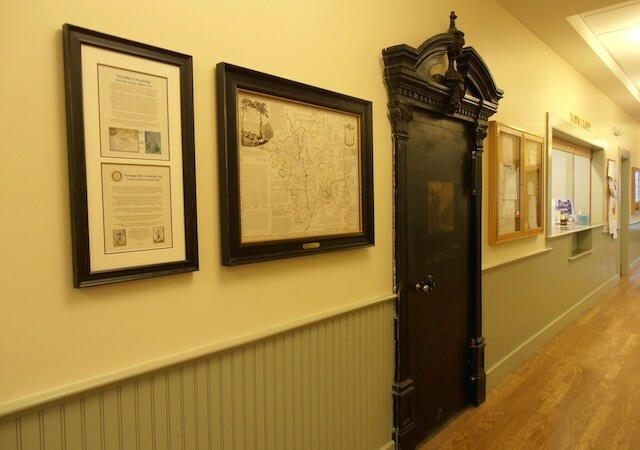 Location of maps and history in the Sturbridge Town Hall - 1st floor hall near the old safe door.